Deep Dish Apple Pie - Do You Know The Muffin Man? I didn’t use the crust recipe from the magazine because it was an all-butter one, I like a combination of shortening and butter to give both flavour and flakiness. 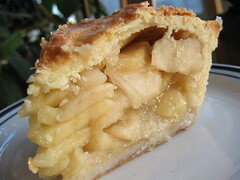 The apples used were Golden Delicious (sweet) and Cortland (tart). After cooking the filling first, I didn’t drain them right away; after a night in the refrigerator, they had absorbed all the water again, so I added a bit of cornstarch to be sure. Crust recipe from The Dessert Bible by Christopher Kimball; filling recipe from Cook’s Illustrated, September & October 2005.